Enquiry about the disposition of beam engine pumps. I am playing with some castings for the Vulcan Beam Engine, described by E.T.Westbury M.E. vols 111/2 1954/5. It is not a model of a specific prototype but rather "a characteristic design based on early 19th century practice" using an engraving dated 1847 as inspiration. My question is; how are the pumps placed relative to each other and the beam when there is more than one pump? As drawn the engine is non-condensing and has a single boiler feed-pump driven from a boss located on the flywheel side of the beam-fulcrum. However, Mr Westbury writes that the engine can be converted to a representation of a condensing engine by the fitting of a second pump which he describes as being similar to the boiler feed pump, except twice the diameter. However he gives no clues as to how and where this second pump would be fitted. I have only been able to find a single photo reference albeit in video form showing a two pump version of 'Vulcan' and in this case the two pumps are located side by side on a line at right angles to the beam using the single pump driving boss on the beam. The pumps are therefore offset from the beam, one to the left, and one to the right, and adjacent to each-other. Would that have been prototypical? Nota: I am not in any way criticising this model, but am curious as I have no knowledge whatsoever of beam engine practice. Prototype drawings of the period (1830's?) that I have found appear to show pumps driven directly from the beam with one boss and driving rod per pump, one drawing even seemingly showing a pump driven from the lower links of the parallel motion nearest the beam fulcrum point. Would multiple pumps have been driven from separate individual bosses on the beam and so placed in-line immediately beneath the axis of the beam? And, if so, ..... what would their probable disposition have been? Placing the 'second' pump the same distance from the beam fulcrum but on the other-side (piston end) of the beam fulcrum from the first pump may conflict with the valve-gear rocking shaft, but could probably be overcome. That side is already very 'busy' however with parallel motion and valve-gear. Placing the second pump on the same (flywheel) side of the beam as the boiler feed pump but further from the beam fulcrum (and if so.... by how much?) would increase the stroke, but this may allow a reduction in the proposed diameter. Or, when Mr Westbury wrote to double the diameter of the second pump did he perhaps anticipate it being fitted between the boiler feed pump and the fulcrum, thus having a shorter stroke? To add more confusion to the issue Westbury further mentions additional pumps driven from the engine, for example to supply service water to the industry, and injection or hotwell (for condensing engines) as well. However he gives no clues as to location, sizes, etc., assuming a familiarity with the disposition of these items on the part of any constructor. A familiarity sadly lacking in my case! But, perhaps you know how at least the two pumps, boiler feed and condensing, were probably arranged and can advise? I think just about anything goes as far as number and position of pumps are concerned. If you take a look few a few of George Watkins' books you will see so many variations. Your biggest problem will be the lack of room on the Vulcan though it would be possible to rotate the cylinder 180degrees to put the valve chest on the outside with suitable alterations to the linkages then you would have more room between A frame and cylinder. Another option though you won't see your efforts is to extend the piston rod through the bottom of the cylinder and use that as a pump ram as found on a lot of the coffer based 6 column engines. Thank you for your very complete response. Looks like I can get creative and do whatever looks 'reasonable' and also 'fits' then. Mind you, in the nature of these things, once I have committed metal etc., someone will inform me that I have chosen the one completely NON-prototypical layout! Phil, if he says your wrong, ask him how he built his one, most of those types wouldn't know what a lathe was, lrt alone use one. Thanks for your suggestion. My thankfully extremely limited experience of such individuals is that they can be rather over-persistent. I was going to cite Jason as my authority for whatever I did - I'm sure that he has broad shoulders ( ), but undoubtedly your suggestion is better as it wouldn't bring his reputation into (potential) disrepute! I have also received much information privately from another forum-member giving me very useful information and details of Cornish beam-engine layouts, so I have plenty of options and ideas to mull-over. I doubt you will ever fail to come up with a way that hasn't been used! At Clay Mills Pumping Station they have a small horizontal engine that has had automatic lubrication added to everything, it bristles with pipes and drips and dangling wicks with barely two moving surfaces lubricated in the same way. I'm sure it was just one of the site engineer's 'hobby' to see what sort of solutions he could come up with. I suspect that your observation is absolutely correct as it seems to me that these early engines were each built individually, albeit around a basic form, to meet each individual customer's requirements. As you observed in your interesting example, engines were then further altered by the client (for whatever reasons) meaning that no two engines were alike. However, in his introduction to the Vulcan model Westbury writes, "I am dead against the type of model so often seen, which may bear a superficial resemblance to an early type and embody similar basic principles, but is hopelessly out of proportion in its components, and full of anachronisms in details and constructional methods". In the course of the series Westbury gives a number of options but doesn't give much detail. He acknowledges this in the final part in writing, " Perhaps I may be criticised for the number of alternatives and modifications in the design which I have described as permissible.......". Maybe sixty years ago when the articles were written many model engineers were better informed than I am (not difficult!) and knew where and how the diverse options would be arranged. However, the prototype design was over 120 years old even then and I can only find one example of the Vulcan built with a 'non-basic' layout, which suggests to me that few know the disposition of the options. 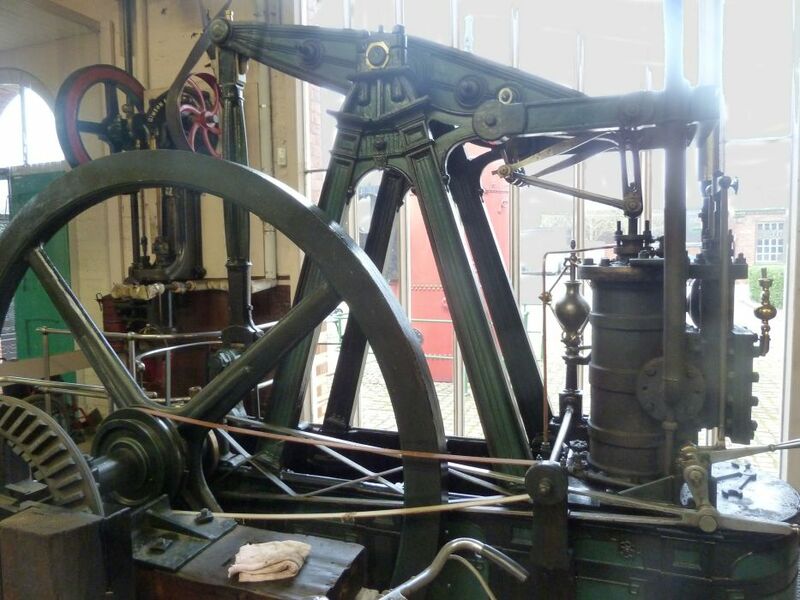 I am totally ignorant of beam engines, so before creating too-much scrap I thought that it might be best to canvas more knowledgeable members of the forum in order to keep any model 'in character' to Westbury's design and also so as not to distress his spirit too much! I've just come across this thread. Sorry to be a bit late! Over the years a couple of people have observed that the stays between the "A" frames and the top of the cylinder are unusual; which they are. However, in one of the books by George Watkins I have seen a beam engine with just this arrangement, and the same design of "A" frame. I think it was driving a land drainage scoop wheel. Not sure. If I can find the picture, would you like a copy to study? It will take a little while, as I have a lot George Thomas's books of engine photos. These books are pure gold if you want to see engine details. If you fit an air pump, it will have to be much larger than the feed pump, as it has to cope with the condensate, and the injection water. The body of the air-pumps was usually beneath the bedplate, with just the top cover visible. The drive was commonly taken from the mid point of the drop links nearest the centre pivot, as this point also moves in a nearly straight line, like the links for the piston rod. A knuckle joint is commonly fitted at the lower end of the pump rod to connect it to the piston rod in the pumps itself. The bridle that connects the pump rod to drop links has a pronounced "U" shaped off-set in its centre to clear the beam on the down stroke. Let me know if you are interested in seeing the photo. I suspect that in most cases auxiliary pumps (and many steam engine might have such pumps for an array of different purposes) will not have been designed specifically for the engine in question. This is particularly true if something like condensing was 'retro fitted' or a pump was needed for some process unrelated to operation of the engine and its main function as a source of motive power. In such cases the arrangement would be primarily determined by availability of a movement of suitable stroke length and secondly by the most convenient position. This means such pumps can be driven from the beam or from various reciprocating parts including the parallel motion and cross-head. Least likely is a dedicated eccentric as this would require a suitable space to be available on the crankshaft. Asymetric levers can be used to change the stroke length and/or direction. To be true to Westbury's wish for realism, imagine yourself as a scale-sized engineer and think where you would want it to be to work well and be accessible without messing anything else up. Page 93 of the london & SE book has a similar style engine in a London gin distillery, I'll scan it later. 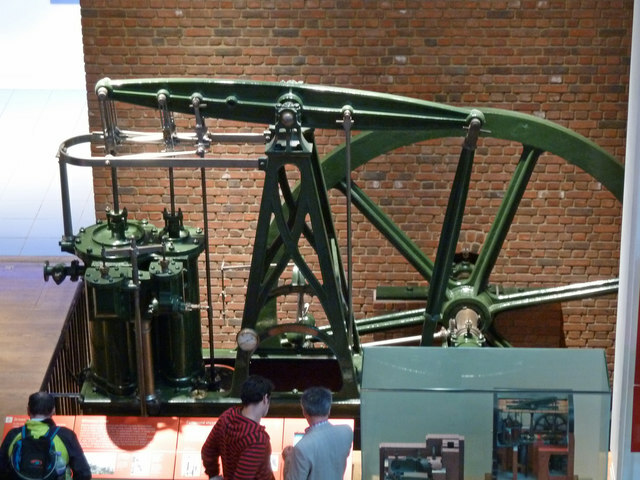 Two early house built engine with water and condensor pumps from chains on sectors on the beam. 'Watt engine for Robison' of 'gloroius complexity'; four drives one off parallel motion, three off the beam. Early Boulton & Watt engine, three drives from underside of piston, parallel motion and beam on far side of pivot. Evan's Grasshopper - two air and water pumps driven from separate points on the beam between the mid-point and the pivot end. Hornblower's compound, from the beam, one either side of the pivot with one split to operate two cylinders. Unknown column and house-built beam engine - four(!) rods dropped from the beam along its length for various purposes. McNaught compound. One dropped from the LP parallel motion and one from the beam. Horizontal engines appear to show a greater variety than beam engines. Conclusion... for a beam engine the beam provide many places where you can place a pivot and to get the motion you require. Distance along the beam seams arbitary so is probably determined by the pumps needs and function. Drive from the beam is usually arranged to one side of the beam, except for wooden beams where it can easily be attached to the underside. Drive from the parallel motion is either from the lower pivot rod or the lower end of a rod fixed alongside (but spaced behind) one of the motion's vertical rods. The examples I found were engines with the parallel motion under the beam. Clearly some of these arrangements are likely to have the cylinder off the centre line. Bear in mind a condenser air pump will always be close to the cylinders. Well that was fun... I'll control myself and not try and figure out all the options for horizontal engines! But it does have a boss on the beam between pivot and crank rod that has a stub which would appear to be provision for fitting one! Side by side seems to be unusual, although Jason found a photo of one, presumably as most pumps are either too large in diameter or have different strokes. Thank you for all the contributions. They have certainly given me plenty of leads for searches and I have a couple of books ordered. Westbury himself acknowledges that: "The engine is a little unusual in the design of the "entablature" or framing around the top of the beam supports and above the cylinder; in fact, it may be said to lack this feature, in its true sense altogether". Later he continues on the same theme, "In this case, a horizontal frame of U-shape attached at its ends to the tops of the A-frames, and at its centre to a vertical bar mounted on the cylinder, serves the purpose of the entablature." The origin of the Vulcan (Westbury) design is attributed by him as follows: "The design.....is one based on an engraving found in a very dilapidated and dog-eared text-book on the steam engine dated 1847,........the design could not have been later than about 1830. It is in my opinion a fairly typical example of one of the earliest engines of all metal self-contained construction...". He subsequently continues "I may say at once that I have not attempted to adhere exactly to the details of the prototype." Of course the existence of an artists(?) drawing doesn't mean that such an engine was ever constructed, however I'm assuming that the most glaring errors and artistic interpretations would have been picked-up by the original editors and subsequently Westbury himself. Thanks for the excellent pics Neil. These would suggest to me that manufacturers had 'basic' castings that they used for a style/size of engine. If a boss was not required by a particular customer usage then it was simply not used. But it was always there for those that specified a use that would require it, or as you pointed out, for subsequent additions and alterations. I would guess that this casting 'kit of fundamental parts' would allow costs to be minimised; whilst there are some splendid decorated 'architectural style' engines, in general I can't see Victorian industrialists wanting to pay anything but the absolute minimum for a machine that would be 'hidden' in the smallest possible space and never seen by any but the 'driver' and repairers.